Join us for a reception, silent auction, and panel discussion to learn together as a community about the MMIW campaign. 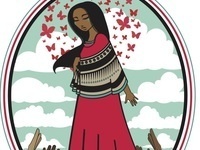 Within the past two years, the Great Basin Indigenous Women Rising, Reno-Sparks Indian Colony, University of Nevada/Reno Indigenous Student Services and Great Basin tribes have worked to provide a voice for a MMIW awareness campaign. It shines a light on the intersectionality of racism and discrimination and the lack of justice on MMIW cases throughout Canada and the US. The MMIW movement works to bring greater awareness to our community and target those individuals who can bring justice and support on these issues. At this event we aim to share stories, provide legislative updates, create continued awareness, and fundraise for the completion of an Indigenous mural in honor of our sisters within the Truckee Meadows. Your participation, donations, and silent auction items are most appreciated. Please contact Beverly Harry (775) 857-7737 or Bethany Sam (775) 297-1003 for information about donations.